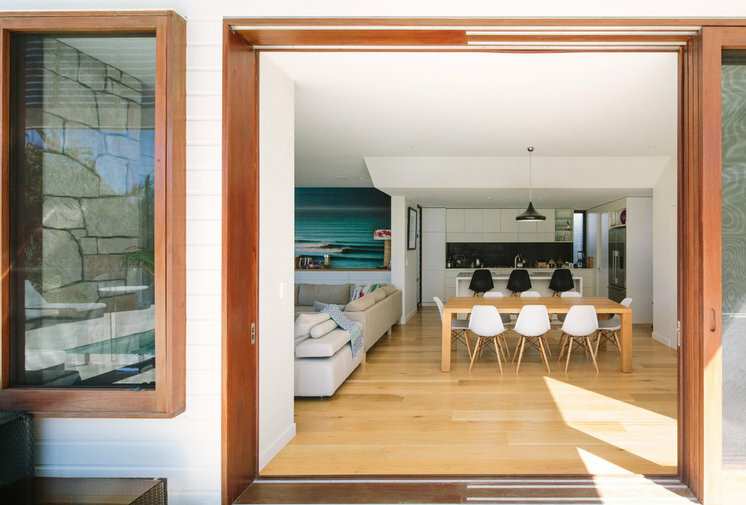 Situated in a prime position that is intentionally unassuming at first glance, this Byron Bay, Australia, house backs onto bush reserve, and beyond that, the beach. 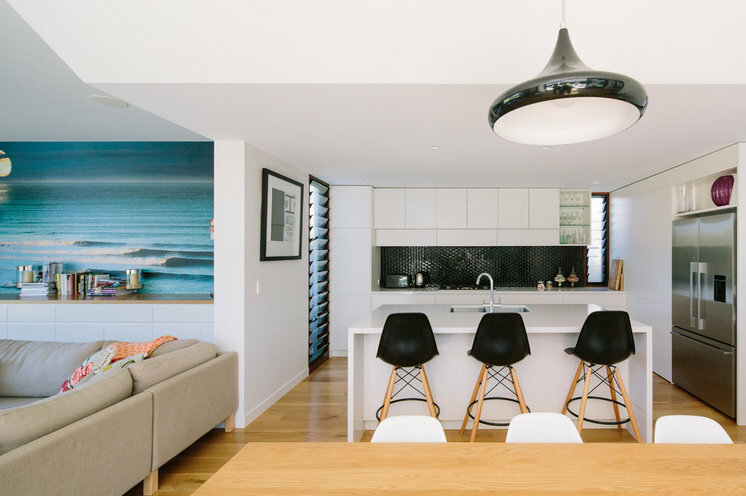 Its location was key in its design, as the client (a surfer who works from home) wanted to ensure a visual connection between the home and its native and coastal landscape. In keeping with this request, the basic elements of water, bush and natural wood dominate the feeling of this house — which shows its full effect out back. Edward Davis, of Davis Architects, took on the brief and designed the house around the central courtyard — what Davis describes as the feature of the home. The floor plan wraps around the pool and deck areas and essentially creates an outdoor living room with an oversized, two-directional cantilevered roof that floats about 20 feet above the outdoor entertaining space and pool. “The facade doesn’t give away what happens at the back of the house,” Davis says. Natural wood and painted weatherboard (clapboard) are used on the front facade so the house can sit comfortably within the street setting. “The Jekyll and Hyde, or two-faced, nature of the house is one of my favorite features,” he says. The detailed wood screens in particular create a sense of mystery while providing ample privacy. 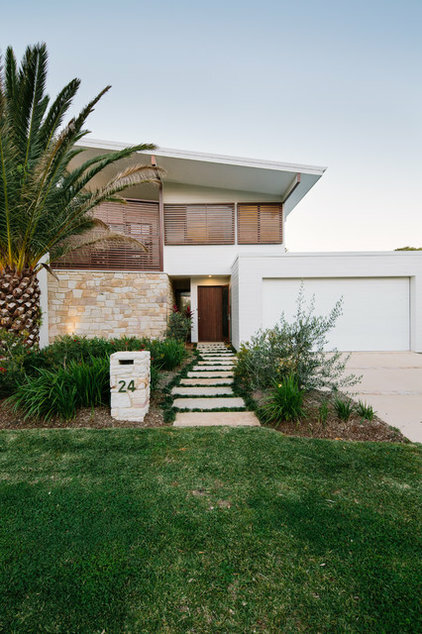 Native landscaping and a plain natural wood front door create a calm and an understated entry. 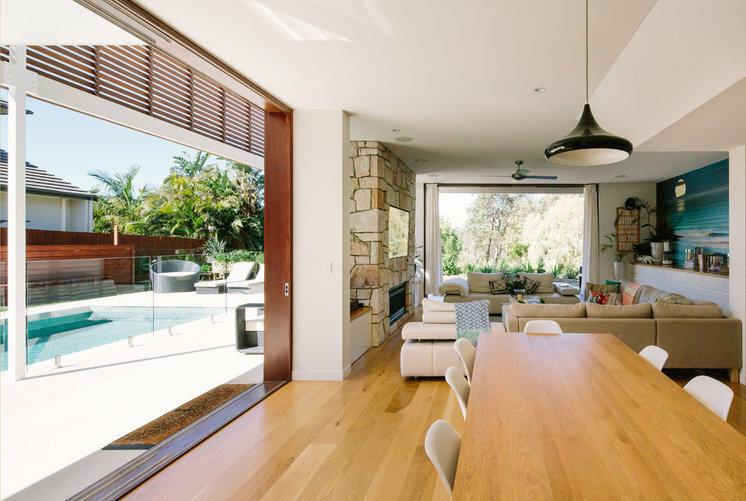 Sustainably grown Australian hardwood was used for the external doors and window frames; it was obtained from a local supplier,Designer Woodworks. Davis prefers to use natural and sustainable materials, and always tries to buy them locally. In this case that included materials for the external doors and windows, cladding, flooring, decking, even the faucets and bathroom fixtures. “We can’t see the point in transporting a product from the other side of the world when the same or superior product is supplied locally,” he says. 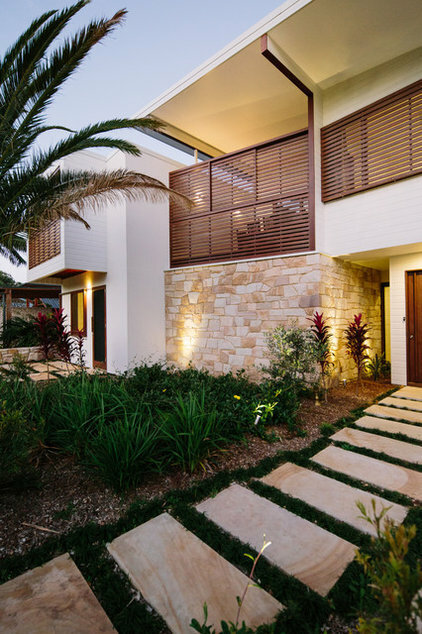 Stone was sourced from a quarry in southeast Queensland and provided the rather fitting stonework seen here and inside the living room. 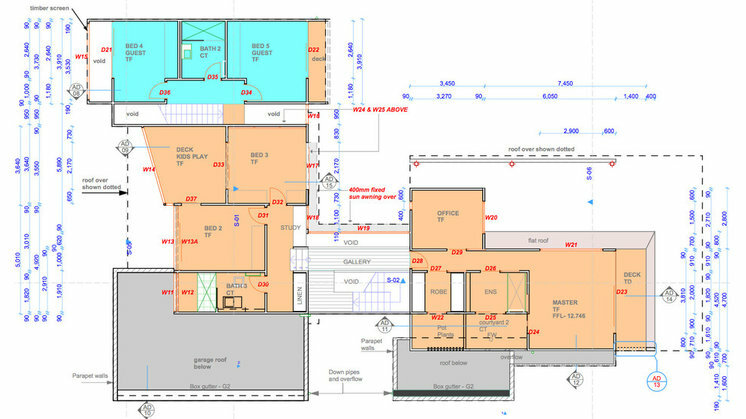 The client also wanted various modes of living in the house, for its use to be as flexible as possible. With that in mind, Davis designed the house to allow for a growing family, a home-based business and separate guest accommodation. The first mode of living incorporates the entire house. 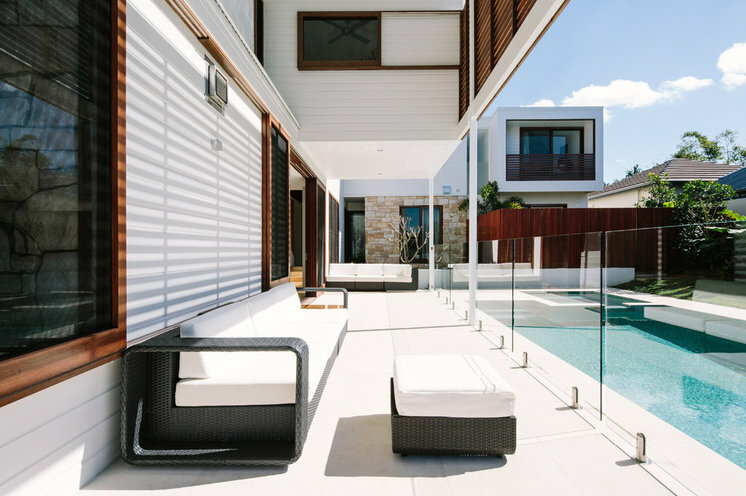 The second allows for the guest wing to be rented out as a self-contained two-bedroom, two-story “townhouse”; and the third allows for the owner to potentially live in the two-bedroom area and rent out the main house. 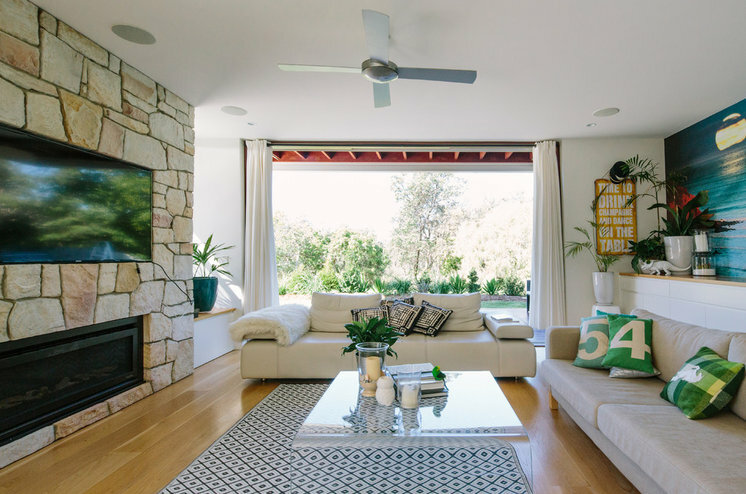 The balmy climate of far northeastern New South Wales meant that cross-flow ventilation was of critical importance when designing the home. 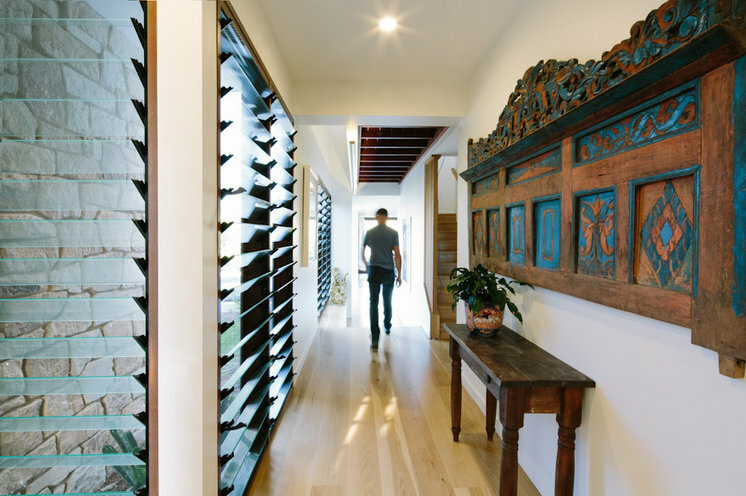 In addition to the floor-to-ceiling glass breezeway that lines the entrance hallway, the central two-story void and internal staircase also incorporate a louvered breezeway to maximize the cooling breeze that is drawn in from the northeast. “Natural convection moves the air up through the stairs and void, where the air is then exhausted out through the second-story roof,” Davis says. The client found the wood wall feature seen here. “There is a definite surf and Balinese theme to the house, and this was part of creating this look,” Davis says. At the end of the entrance hall is the main dining and living area. 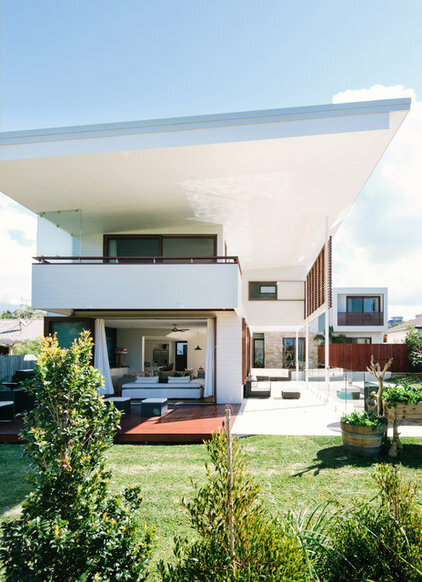 It is at this point that the drama unfolds and the external space and surrounds — swimming pool, spa, garden and native bushland — take center stage. 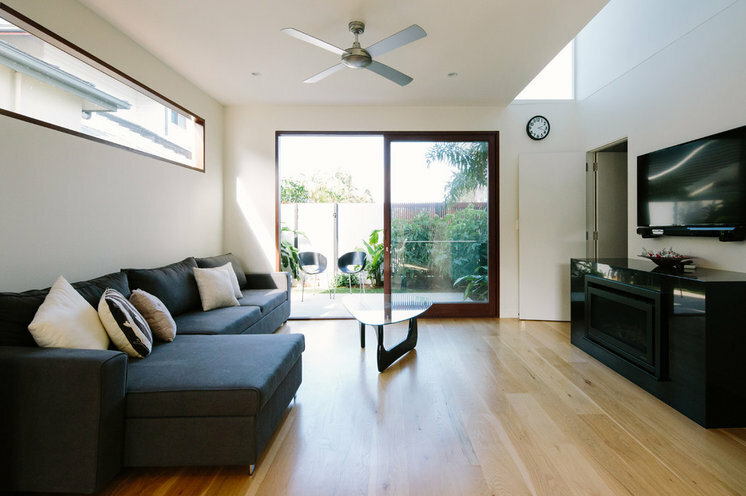 The house is designed to open up to the north and allow winter sun to penetrate deep into all the main living areas. 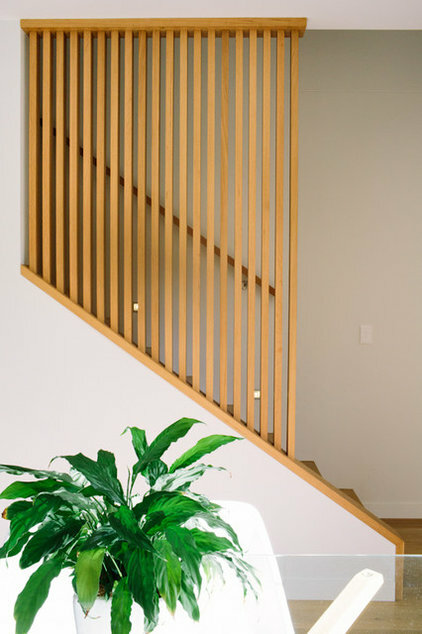 Blackbutt timber was used throughout the house for its light color and slightly uneven texture, which, Davis says, “helps to create a relaxed coastal feel.” The wood came from two local suppliers, Brims Hardware and Old Mill Timberyard. 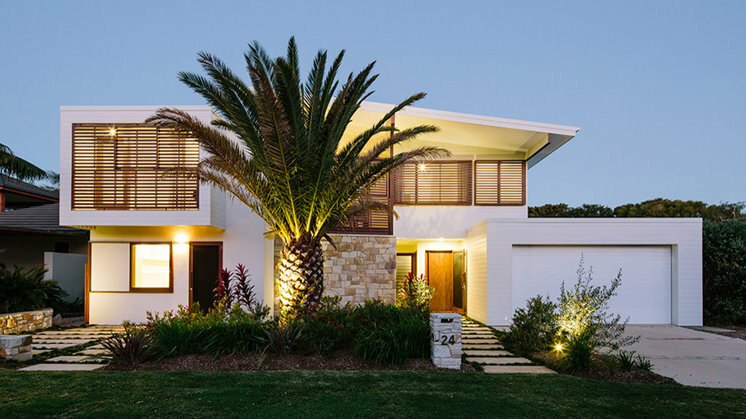 The suburban nature of the property was one of Davis’ biggest obstacles, as the homeowner wanted the house to look expansive, private and resort-like — not an easy feat with neighboring walls and rooftops. 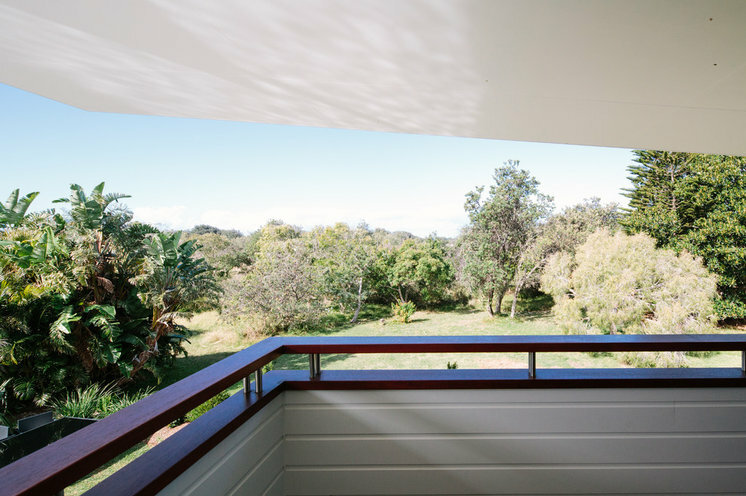 As a result, he designed the house to ensure that the views from all rooms were focused away from the neighbors — toward the east or bush reserve. 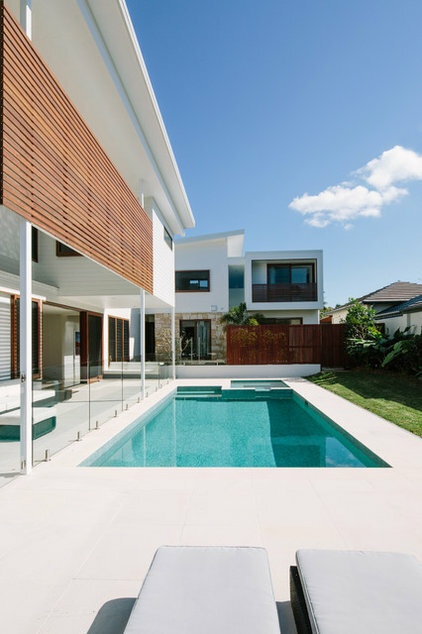 Large wood doors and windows were designed to frame the pool area and highlight the tranquil setting.They slide back on the outside of the building, so the view from the inside looking out is undisturbed. The kitchen is pared down and practical. 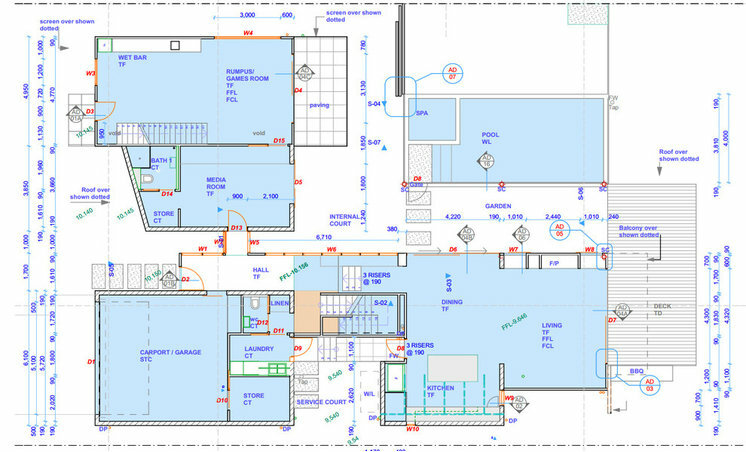 The fridge and walk-in pantry are tucked away on the right-hand side, out of view, so the kitchen appears to be composed of a simple island with the back counter and stove behind. “We wanted the entire living and dining area to flow to the outside, where most of the activity and interest will be focused,” Davis says. 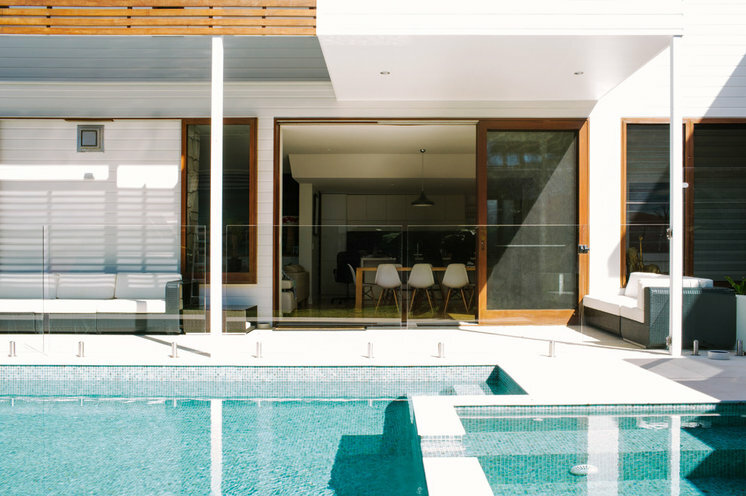 “So really, the kitchen was intentionally quite minimal so as to not compete with the main show, which was the outdoor pool, deck and garden.” The client’s request for finishes that were low maintenance and hard wearing also contributed to this simple design. 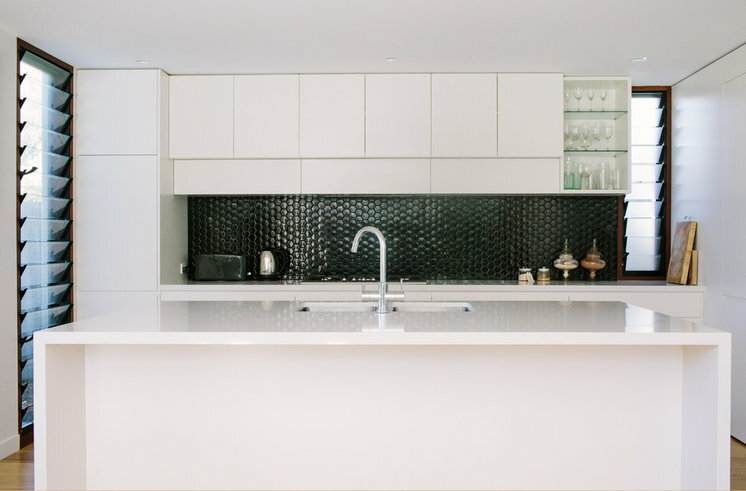 While the backsplash is a feature in the minimalist kitchen, it in no way dominates the room. 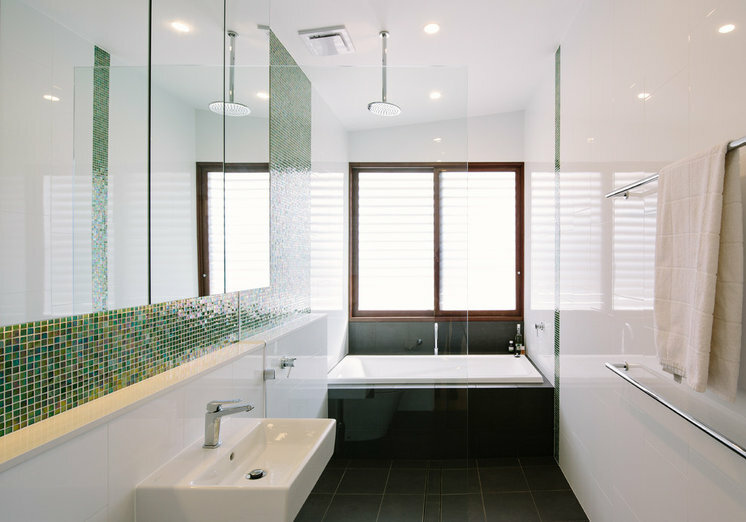 The bathroom is in keeping with the simple design theme and color palette, with wall tiles that echo turquoise waters and sea shells. The living room in the guest wing was designed to be a simple, tranquil and private space that would allow guests to relax without being seen by people in the main house. Most of the bedrooms have views toward the bush. 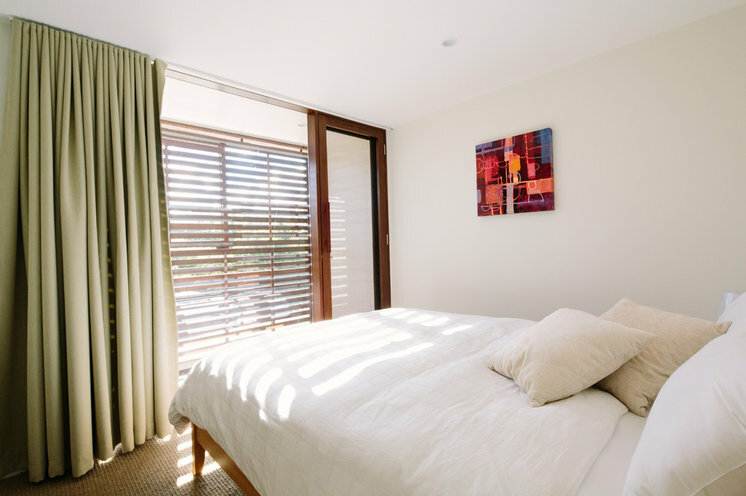 The master bedroom is located in the separate wing for privacy and features its own small media room–den and two outdoor decks, as well as a luxury walk-in closet and an en suite. One deck is for relaxing and enjoying the view toward the east, and the other deck is more private and includes an outdoor bath, which is accessed directly off the en suite. One of the views from the master bedroom’s private deck. Another view from the deck, looking toward the east. From this angle you can see how the guest wing also has uninterrupted views and wraps around the pool, closing off the space from neighbors.